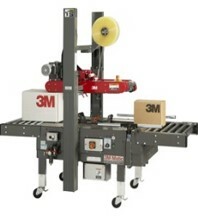 3M-Matic Case Sealers represent an economic avenue of automation for box sealing. Whether your requirements are adjustable, random or product-specific, 3M-Matic Case Sealers offer a solution to meet nearly any application. We offer equipment for taping non-RSCs, unitizing pallets, forming cartons, and carton sealing in high moisture environments. Each of these solutions offers a unique benefit to your operation and can improve productivity and efficiency. 3M-Matic™ Stainless Steel Case Sealers- Consistent productivity in corrosive environments! 3M-Matic™ L-Clip Applicator S867-Productivity for “pizza” boxes and other variety of box shapes. 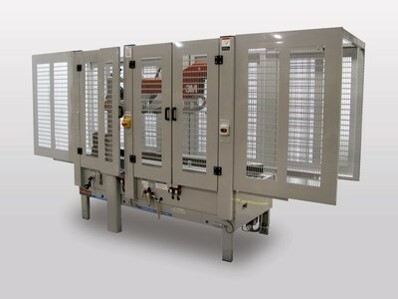 Case Erectors- Case erector can form and seal the widest variety of cases, from single wall to triple wall corrugated. 3M-Matic™ Case Sealer 200a with 3M™ AccuGlide™ 3 taping heads is designed to seal the top and bottom center seams of up to 40 uniform regular slotted containers per minute. A heavy duty gear motor provides power to the bottom belt drive, and adjustable side guides position and align your boxes for quick and easy throughput. Our 3M-Matic™ Case Sealer 200a (PDF, 2.92 Mb) is a sturdy, space-saving unit designed to handle your basic regular slotted container (RSC) sealing needs. With a 16-gauge welded steel frame and epoxy paint finish, it is engineered for shift-after-shift productivity. The 3M-Matic™ Case Sealer 200a features a bottom belt drive and upper and lower 3M™ AccuGlide™ 3 taping heads as well as an alternative outboard mount for the lower tape roll. A height adjustment crank raises or lowers the taping head to adjust to box height and compression rollers position the top flaps of each box for precise sealing. Dual masts include twin lead screws for stop relocation and stronger taping head stability. The gear motor provides power to the laced drive belts which run at 100 ft per minute. It can be quickly shut down using the centrally located emergency stop switch. After setup, 3M-Matic™ Case Sealer 200a continues to feed same size boxes at a rate of 40 boxes per minute. To change box configuration, simply readjust height and width to accommodate the new case size. Designed to apply a “C” clip of 2″ Scotch® box sealing tape, the 3M™ AccuGlide™ 3 Taping Heads seal the top and bottom center seams at speeds of up to 40 cases per minute. With a flowing, curvilinear form for low impact and consistent application, 3M™ AccuGlide™ tape heads help protect the boxes while providing greater case throughput. A regular slotted container is placed on the conveyor and pushed onto the drive belts, which convey the box into the taping head. The 3M™ AccuGlide™ 3 Taping Head applies Scotch® pressure sensitive film box sealing tape at the leading end of the box continuing along the center seam to the trailing end. This is called a “C” clip application. The taping head cuts the tape as it is being applied. After the box is securely sealed, it exits the case sealer. Taping heads usually function in pairs to tape two seams of a case. When they tape the top and bottom, taping heads are mounted in an upper and lower configuration. Taping heads can also be mounted for sealing a case lying on its side. And any of our other Scotch® or Tartan™ Box Sealing Tapes. 3M-Matic™ Side Belt Adjustable Case Sealer 8000a With 2″ 3M™ AccuGlide™ 3 Taping Head is an adjustable side belt drive case sealer. This adjustable case sealer comes equipped with a spring-loaded, side belt drive designed for narrow profile boxes. Engineered with 3M™ AccuGlide™ 3 Taping Heads, this case sealer offers reliable application of tape without box damage. 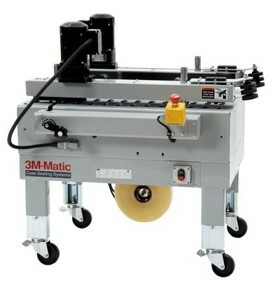 3M-Matic™ Side Belt Adjustable Case Sealer 8000a With 2″ 3M™ AccuGlide™ 3 Taping Head is an adjustable side belt drive case sealer that can seal up to 40 cases per minute, providing efficient productivity. 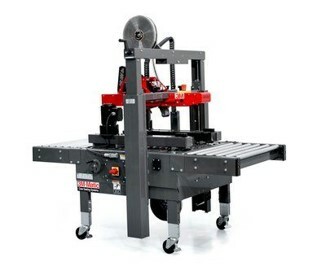 Engineered with a spring-loaded, side belt drive, this case sealer is able to process narrow profile boxes. With 3M™ AccuGlide™ 3 Taping Heads, we designed this case sealer to reliably apply tape without causing damage to packages. The interchangeable 2-inch or 3-inch taping heads of 3M-Matic™ Side Belt Adjustable Case Sealer 8000a allow for flexibility in production. In addition, its easily accessible, side-mounted, height adjustment handle and reference ruler make height adjustments simple and its rugged, dual-extruded columns offer smooth incremental adjustments. We constructed this side belt adjustable case sealer with a 16-gauge welded steel frame and powder coat paint finish for long-lasting durability. Other features of this product include: Top flap compression rollers, spring-loaded upper drive assembly, dual lead screws and a centrally located emergency stop. Optional features include: Infeed and exit conveyors, locking casters, low tape indicator and box hold-down attachment. 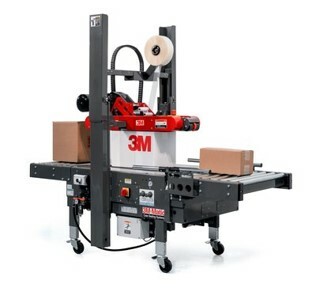 3M-Matic™ Side Belt Adjustable Case Sealer 8000a With 2″ 3M™ AccuGlide™ 3 Taping Head provides fast and flexible tape application that can streamline end-of-line process of packaging. This side belt case sealer gives manufacturers and distributors the packaging flexibility and speed to meet the competitive demands of their industries. The 3M-Matic™ Side Belt Adjustable Case Sealer 8000a is an exceptional, high-volume solution for optimal box sealing productivity. 3M-Matic™ Random Case Sealer 7000r Pro With 2″ 3M™ AccuGlide™ 3 Taping Head is an advanced technology case sealer and ideal solution for top and bottom sealing of random-sized cases. Automatically adjusting to both case height and width, our 3M-Matic™ Random Case Sealer 7000r Pro can handle up to 24 different case sizes per minute. 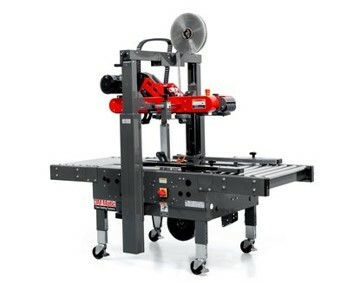 3M-Matic™ Random Case Sealer 7000r Pro With 2″ 3M™ AccuGlide™ 3 Taping Head is a random case sealer that automatically adjusts for case height and width, capable of sealing 24 cases per minute. With the 3M™AccuGlide™ 3 Taping Head, our case sealer can apply tape to many different sized boxes with reliable performance. The auxiliary offset taping head position provides flexibility in the sealing process for shorter boxes. This case sealer can apply a range of tape sizes and comes with a standard 2-inch taping head, however a 3-inch taping head can be easily interchanged for wider tape applications (up to 3 inches). This sealing machine can be used in industries where mixed box sizes are common, such as manufacturing and distribution centers. 3M-Matic™ Random Case Sealer 7000r Pro With 2″ 3M™ AccuGlide™ 3 Taping Head features a non-contact box detection for centering through photo eye detection. The photo eye detection responds quickly to cartons of different widths, allowing production to easily continue. Our case sealer is also built with an electro-mechanical height adjustment for precise application. 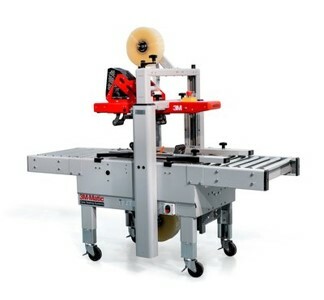 Designed with a top and bottom belt drive, 3M-Matic™ Random Case Sealer 7000r Pro also offers positive box conveying. Additionally, this case sealer comes with a centrally located emergency stop, dual masts and an infeed conveyor. If necessary, you can also add supplemental parts, such as an exit conveyor, locking casters, low tape indicator and a light indicator. Today, companies need to be fast and flexible in every phase of their operations, including end-of-line packaging. The end of your production line is no place for bottlenecks and that’s why rock-solid dependability is the most important attribute of a case sealer. 3M-Matic™ Case Sealers have been setting the bar for reliable and consistent sealing for more than 45 years. 3M-Matic™ Case Sealers provide economic automation for carton sealing. The 3M-Matic™ Random Case Sealer 7000r Pro gives manufacturers and distributors the packaging flexibility and speed to stay one step ahead of the competition. 3M-Matic™ Dual L-Clip Applicator S867 II applies two 4.5” L-clips of Scotch® Filament or Reinforced Strapping Tape (RST) on the same edge at up to 50 clips per minute for sealing non-standard boxes. The machine is designed for installation adjacent to a conveyor system or on a stand for off-line systems. 3M-Matic™ Dual L-Clip Applicator S867 II allows the operator to quickly apply two “L”-shaped clips of tape as close as 8″ apart on the same edge of non-RSC (regular slotted carton) style boxes. When a box is inserted into the nest, the contact plate easily and safely triggers the pneumatic mechanism to apply the tape. The applicator has been designed and tested for use with Scotch® filament and strapping tape and supports tape widths of 12 mm to 36 mm. Consistent tape lengths of 4.5″ help reduce waste. 3M-Matic™ L-Clip Applicator S867 applies 4.5” L-clips of Scotch® Filament or Reinforced Strapping Tape (RST) at up to 50 clips per minute for sealing non-RSC style boxes. The machine is designed for installation adjacent to a conveyor system or on a stand for off-line systems. 3M-Matic™ L-Clip Applicator S867 allows the operator to quickly apply the “L” clip box closure. When a box is inserted into the nest, the product paddle is depressed and the air operating mechanism which applies the “L” clip tape closure is activated causing the “L” clip to be automatically applied to the box corner. The applicator has been designed and tested for use with Scotch® filament and strapping tape and supports tape widths of 12 mm to 36 mm tape. Our 3M-Matic™ Adjustable Case Sealer 7000a Pro With 2″ 3M™ AccuGlide™ 3 Taping Head seals your boxes swiftly and reliably, shift after shift, year after year. With expanded box size capacity and interchangeable taping heads, this rugged sealer allows you to change as your business changes, boosting your productivity, cutting your costs and keeping your business profitable. Companies today need to be fast and flexible in every phase of their operations, including end-of-line packaging. Since developing our Scotch® Cellophane Tape back in 1930, we’ve been at the forefront of box sealing technology, giving manufacturers and distributors the packaging flexibility and speed to stay one step ahead of the competition. Our 3M-Matic™ Adjustable Case Sealer 7000a seals up to 40 cases per minute. The taping heads help maximize production flexibility while the dual-extruded columns allow for smooth incremental adjustments. Plus, the easily accessible side handle and reference ruler also help adjust for a wide variety of case heights. 3M™ AccuGlide™ 3 Taping Heads feature a curvilinear design that applies tape securely with low impact to help protect even lightweight cartons and contents. Designed to apply a C clip of Scotch™ box sealing tape, these taping heads apply tape to the top and bottom flaps with reliable performance. The auxiliary offset taping head position provides flexibility in the sealing process for shorter boxes. 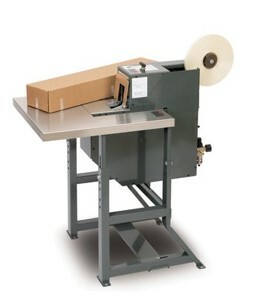 This case sealer can apply a range of tape sizes and comes with a standard 2″ taping head, however a 3″ taping head can be easily interchanged for wider tape applications. 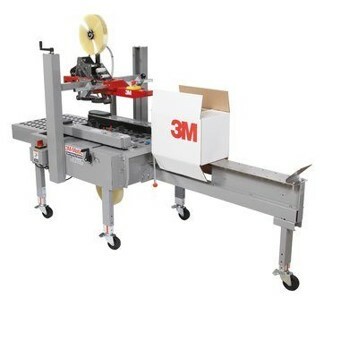 3M-Matic™ Adjustable Case Sealer 7000a Pro With 2″ 3M™ AccuGlide™ 3 Taping Head offers the fast productivity and consistent results necessary to stay on top of packaging demands. Enjoy the benefits of our durable case sealer for exceptional results! 3M-Matic™ Case Sealer 800ab with 3M™ AccuGlide™ 3 Taping Head is a manually adjustable unit that automatically seals the bottom center seam on a wide range of case widths. The twin gear motor drives power traction-grip drive belts on each side to center and stabilize cases up to 85 lbs. (38kg). This case sealer uses 1.5-2” (36-48mm) Scotch® box sealing tapes and seals up to 40 cases per minute. Our 3M-Matic™ Case Sealer 800ab with 3M™ AccuGlide™ 3 Taping Head seals the bottom center seam and manually adjusts to a wide range of case widths. It features a rugged 16-gauge welded steel frame and epoxy paint finish, with traction-grip belts to center and stabilize boxes for consistently accurate taping. 3M™AccuGlide™ 3 Taping Heads offer low impact sealing to protect cases. 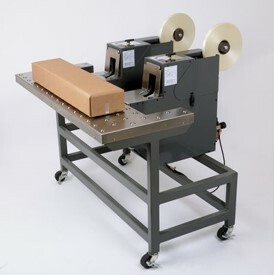 This box sealer uses 1.5-2″ (36-48mm) tape to seal up to 40 uniform boxes per minute: case lengths of 6″ (150mm) or more, widths of 4.5-21.5″ (114-545mm) and heights of 4.75″ (120mm) or more (max height depends on box stability through the sealer). The twin gear motor drives allow for high volume and heavy duty sealing applications, managing regular slotted containers (RSC) weighing up to 85 lbs. (38kg). Designed to apply a “C” clip of Scotch® box sealing tape, the 3M™ AccuGlide™ 3 Taping Head seals the bottom center seam. With a flowing, curvilinear form for low impact and consistent application, 3M™ AccuGlide™ taping heads help protect boxes while providing greater case throughput. A regular slotted container (RSC) is placed on the conveyor and pushed into the drive belts, which convey the box into the taping head. The 3M™ AccuGlide™ 3 Taping Head applies Scotch® pressure sensitive film box sealing tape at the leading end of the box, continuing along the center seam to the trailing end. This is called a “C” clip application. The taping head cuts the tape as it is being applied. After the box is securely sealed, it exits the case sealer. 3M-Matic™ Case Sealer 800af with 3M™ AccuGlide™ 3 Taping Head seals both top and bottom center seams of regular slotted containers without the need for an operator. It automatically folds the top flaps and applies a “C” clip of Scotch® box sealing tape to the top and bottom of the box — at speeds of up to 40 uniform cases per minute. Located on each side of the 3M-Matic™ Case Sealer 800af, traction-grip drive belts center and stabilize boxes for consistently accurate taping. Flaps are automatically folded and sealed at the top and bottom center seams with a “C” clip of Scotch® box sealing tape. Designed for use with 1.5″-2″ (36-48mm) Scotch® Box Sealing Tapes. The Energy Saving Control Button is located on the column below the Emergency Stop Button on the Operator side of the 3M-Matic™ Case Sealer 800af. Pressing the lighted Energy Saving Control Button engages/disengages this feature. When engaged, the drive belts will stop if there is not a continuous flow of boxes through the machine. Inserting a box will re-start the machine. 3M-Matic™ Case Sealer 800af features dual side belt drives and upper and lower 3M™ AccuGlide™ 3 taping heads as well as an alternative outboard mount for the lower tape roll. A height adjustment crank raises or lowers the taping head to adjust to box height and compression rollers position the top flaps of each box for precise sealing. Twin gearmotors provide power to the dual side drive belts which run at 78 feet per minute. It can be quickly shut down using the centrally located emergency stop switch. After setup, 3M-Matic™ Case Sealer 800af continues to feed uniform boxes until a different size box must be fed. Then simply adjust the height and width to accommodate new size. An integrated box gate (indexer) with adjustable pressure and height helps to separate boxes from a flooded infeed conveyor while the safety-interlocked hinged access doors with steel screen allow easy viewing of case flow. Designed to apply a “C” clip of 2″ Scotch® box sealing tape, the 3M™ AccuGlide™ 3 Taping Heads seal the top and bottom center seams at speeds of up to 28 cases per minute. With a flowing, curvilinear form for low impact and consistent application, AccuGlide™ tape heads help protect the boxes while providing greater case throughput. Dual masts include twin lead screws for stop relocation and dual crossbars for stronger taping head stability. A regular slotted container is placed on the conveyor and pushed onto the drive belts of a 3M-Matic™ Case Sealer, which convey the box into the 3M™ AccuGlide™ 3 Taping Head. The 3M™ AccuGlide™ 3 Taping Head applies Scotch® pressure sensitive film box sealing tape at the leading end of the box continuing along the center seam to the trailing end. This is called a “C” clip application. The taping head cuts the tape as it is being applied. After the box is securely sealed, it exits the case sealer. Taping heads usually function in pairs to tape two seams of a case. When they tape the top and bottom, taping heads are mounted in an upper and lower configuration. Taping heads can also be mounted for sealing a case lying on its side. Our 3M-Matic™ T-table Attachment is a 6″ x 44″ T-table attachment for use with 3M-Matic™ Adjustable Case Sealers a80 and a80-3. When you add this durable extension you will increase the capability of a packing station and fold bottom flaps for various boxes, increasing productivity while reducing labor. We offer a full line of case sealers that can improve productivity and reduce operating expenses at the end of your packaging line — the most expensive place in your plant for bottlenecks. With everything from semi-automatic adjustable systems, to fully-automatic random systems, our 3M-Matic™ case sealers are consistent and durable, require low maintenance and help your case sealing operations run reliably. Each model features our low-impact 3M AccuGlide™ II Taping Head with its curvilinear track, which helps to securely and carefully seal lightweight corrugated cases with Scotch box sealing tape. 3M-Matic case sealers can also help reduce labor costs and decrease downtime because of the equipment’s features and improved processes versus hand taping or stapling. In short, you can expect a more efficient, more productive operation when 3M is on the case.